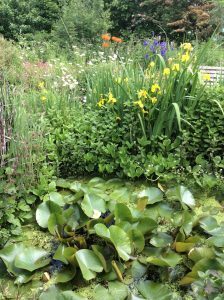 Summer is here, long hot days of brilliant sunshine with cooling breezes wafting up the valley, geraniums of every hue beaming out from the borders and, as always, much activity at the Pales. 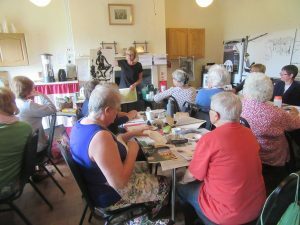 Another successful Art Day, Fellowship Day which included Tai Chi on the lawn, and preparations for the forthcoming Summer Concert; if you haven’t already got your tickets you can buy them on the door on the day. Materials’ led by the distinguished Welsh artist Sandy Craig: Sandy is especially interested in monotone, using a variety of materials, and she began by showing us some impressive examples of her own work, and of other artists who have worked in this field, ranging from Rembrandt to Picasso. We started with charcoal, studying thegradations between light and dark, and were then tasked with creating a still life on a grey background, adding highlights by means of a putty rubber. 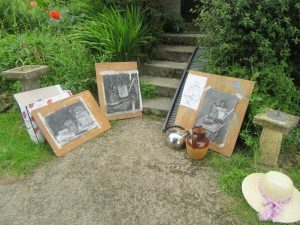 An assortment of old watering cans, kettles, jugs and miscellaneous household items provided plenty of inspiration as we worked out of doors in the sun. The ability to make rapid changes with charcoal was appealing, even if one’s hands got rather grubby, and we enjoyed viewing each other’s efforts. After a sociable lunch break we gathered in the schoolroom to be instructed in the use of dip-pen and ink. In contrast to charcoal, gradations of tone in pen are achieved through fine line and delicate cross-hatching. But Sandy also offered some ingenious alternative ways of applying ink –including blowing through a straw and using different kind of implements to create a starting point, particularly helpful if one suffers from the’ fear of the empty white page’. Sandy had other handy hints – using blu-tack as an effective and cheaper alternative to a putty rubber! And artists, like athletes, need to warm up – a good method is to ‘ take a line for a walk’ (the pen or pencil must not be lifted from the page). Our ink task in the afternoon was to sketch some plants and then add a black ink background. This proved quite taxing, and time ran out. But we had all learned a lot, and felt inspired to experiment further with a variety of techniques and materials. The evaluation forms were full of praise for Sandy’s tuition and appreciation of an enjoyable day in an exceptional setting. 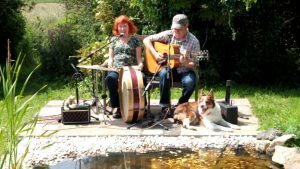 You are invited to a bring your picnic to the Pales on the afternoon of June 23rd for an evening of English and Welsh poetry and music. Tickets are still available and cost £8. They are available on the door or from Trustees, members of the Pales Management Group and through the Pales website. The concert will start at 7pm. 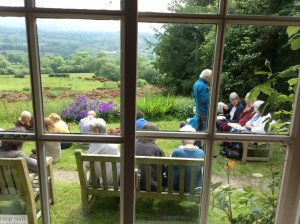 June Area Meeting at the Pales took the form of a Fellowship Day. The agenda for the day was arranged by Jeff Beatty, clerk to Elders, Overseers and Pastoral Care Groups. Representatives from seven Local Meetings met at 10.00am to discuss the spiritual life of their Meetings and this was followed by Meeting for Worship. We were joined in the Meeting Room by others from the Area Meeting and so twenty four Friends and three young Friends met in worship. 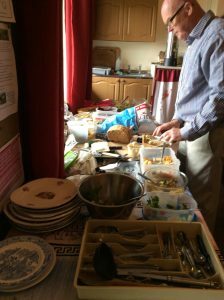 Shared lunch followed and as always the variety and volume of food provided was large and Friends were able to take plates of earthly delights out to the garden and eat in the sunshine. The activity arranged by Jeff for the afternoon was an introduction to Tai Chi, which combines deep breathing and relaxation with flowing movements. Originally developed as a martial art in 13th-century China, tai chi is today practised around the world as a health-promoting exercise. 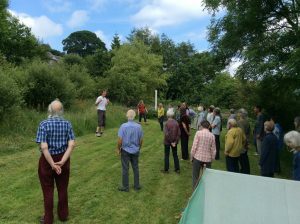 Our tutor, mike Buckley, recommended by Peter Hussey, led us down to the camping ground and began with a few simple exercises in standing correctly, with our knees flexed and not locked rigidly. We then went through some breathing exercises and ended with ‘following’ exercises designed to free your mind from intruding thoughts by forcing you to concentrate on following the motion of two friends; with both hands resting on their outstretched hands the aim was to match all their movements simply by feeling for the pressure of their hands. Simultaneously both simple and complex. The day ended with tea and cakes, always a satisfactory finale to an enjoyable, entertaining and educational day. Green Art at the Pales 11.00 on the 9th August. 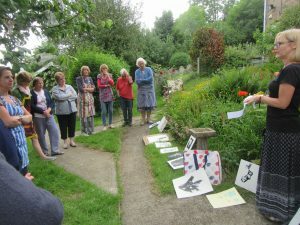 A day for Ffriends of all ages, exploring the Pales grounds, collecting materials to make sculptures and images. Please bring along a picnic lunch and garden clothes. The flora and fauna surrounding the Pales has been obscured in the last few days by a layer of dust. 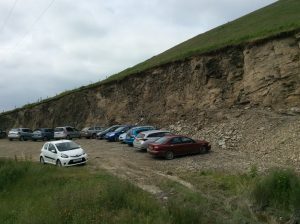 Excavation work at the quarry to provide foundations for the local farmer’s new building has caused large amounts of dust and debris on the approach road; it has, however, improved the area for parking cars. 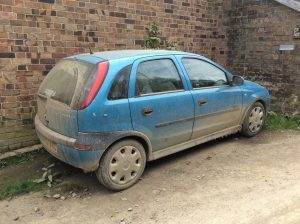 It has not improved the state of Carole’s car!